Music is key to a successful party. Nothing does more to ensure the success of your event. We understand how much your music matters. We will provide the right songs at the right time at the right volume for every part of your wedding, corporate event or private party. This is one thing you don’t have to stress about. Sound Extreme Entertainment knows how to get it right! Sound Extreme DJs have the talent and experience to react to your guests, presenting your song list in the right order to bring your party to life. Awarded Best of Brevard, you will be happy you selected a Sound Extreme DJ. With over 20 DJs to choose from, we can provide the right temperament, personality and style to fit your wedding. Your DJ will skillfully blend your song list reacting to your guests to keep the party going. Always in good taste, we ensure there is continuous music, no uncomfortable gaps. Do you want us to announce your event? Just give us the information. Use our on-line form to provide us with your bridal parties’ names (with pronunciations). Our DJ/MC will help your guests know what to do. We will let them know if this dance is just for you and your new husband and when to join you out on the floor. Our experienced DJ/MC keeps your guests from looking around wondering if they should be sitting or lining up for a buffet. There is nothing like a Live Dance Band to really get your reception off the ground. Crocodile Smile is not just performers. We are experienced musicians. Crocodile Smile can perform your favorite songs the way you want to hear them. We perform a wide range of music, from the classics to the latest downloads. Our musicians are of the highest caliber. What are they saying about us? Here are some of the emails we have received from previous guests and clients. Questions and things to consider when planning your event. Sound Extreme means No Stress! We won’t be late or unprepared. We will show up at least an hour in advance to set up and prepare. There are never "last minute glitches." You guests won’t hear a sound check just before your bridesmaids walk down the aisle. We won't fill up the dance floor with unnecessary clutter. We bring only the latest technology in entertainment equipment. We will be dressed appropriately. Sound Extreme has worked at all of the local Wedding Locations. We have the knowledge and experience to set up efficiently. 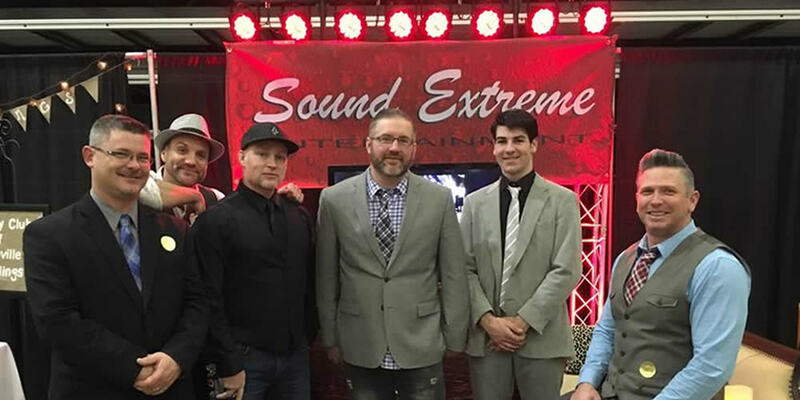 Let Sound Extreme help you create your perfect wedding. Together we will make memories you will have forever. We won’t blast your guests out of the room with unregulated volume.